We should have 159 in stock. Need more? It usually takes us 2 - 3 weeks to bring more in. 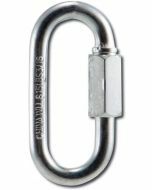 Safety snap carabiner for your light duty applications. Black finish. 0.25" x 1.15" x 2.4"